“I represent nice people who, at the worst, are somebody with an alcohol problem,” said Stephen L. Jones, a defense attorney specializing in drunken driving cases, whose fee to argue a case starts at $10,000. This story was reported by Globe Spotlight Team members Marcella Bombardieri, Jonathan Saltzman, and editor Thomas Farragher. It was written by Bombardieri. The young financial worker said it four times, according to police, as he flubbed each field sobriety test near a Papa Gino’s in Plymouth, where he had almost caused a head-on collision. He’d had a few beers, he said, and hadn’t eaten since noon. Now it was 1 a.m. When he blew into a breathalyzer, it registered .25, more than three times the legal limit. Most defendants would have pleaded guilty to a first offense like this, but the 23-year-old had another idea: He came up with the big money it takes to hire Stephen L. Jones, the dean of drunken driving defense lawyers in Massachusetts. After a string of bad decisions, that move paid off. Jones got the breath-test result thrown out of court. Then he masterfully recast his client’s feeble performance for police as a by-product of fatigue, not beer. The judge’s verdict: not guilty. “I probably look like the cat that ate the canary,’’ Jones said, beaming after a hearing. Call it OUI Inc., the cottage industry of lawyers and expert witnesses whose livelihoods are built on getting drivers charged with operating under the influence of alcohol off the hook - and back on the road. When drunken driving cases go to trial in Massachusetts courts, it is often a clear mismatch, a Spotlight Team review has found — and not just because some judges, as the Globe has reported in this series, are inclined to find defendants not guilty no matter the weight of evidence against them. There are also lawyers like Jones, with thousands of trials behind them, who time and again triumph over relatively inexperienced prosecutors struggling under heavy caseloads. The scales of justice tip their way, and that’s no accident. It’s the way those who write the laws here, and those who adjudicate them, appear to want it. The stars of the OUI bar know when to tip off their clients to bypass the vagaries of the jury for a sympathetic judge. But more important, they go into battle with special legal advantages in this state, especially the prohibition on putting a driver’s refusal to take a breath-test into evidence. It is a devastating advantage for the defense, making proof of intoxication entirely circumstantial: the staggering step, slurred speech, boozy breath, and so on. Only one other state has anything like it. It makes OUI lawyers here the envy of their colleagues across the country. Massachusetts, like other states, also enforces intricate procedures police must follow in making OUI stops, procedures that some officers complete imperfectly, sometimes carelessly, opening easy lines of attack for aggressive counsel. Indeed, the defense lawyers’ favorite courtroom targets are the often inartful investigative reports by the police officer on the scene and the officer’s recollection of events long past. There are rarely other witnesses to the alleged crime. Police officers are trained to look for specific markers of intoxication, but the resulting lingo — “glassy eyes’’ and “thick tongued’’ speech — is often unimpressive to judges who have heard it hundreds of times before. It is, in short, a lopsided competition, and Jones is unapologetic about the fact that his success often means that someone who was in fact driving while impaired gets off without penalty. Like any litigator, his obligation is zealous advocacy for his client. For lawyers who specialize in drunken driving cases, business has never been so good. As drunken driving penalties in the state have gradually gotten more severe, the incentive to go to trial has only grown. Lawyers increasingly encourage their clients to fight rather than plead out. Melanie’s Law, passed in 2005, lengthened license suspensions and imposed on second-time offenders the humiliation of having to blow into a breath-testing device before their cars will start. And a little-noticed 2002 law eliminated any sunset on prior offenses. Defendants with convictions more than a decade old used to be treated like first-time offenders. Not now. A middle-aged father who had a couple of youthful indiscretions in his teens but stayed out of trouble for 30 years now faces six months in jail if convicted on a third offense. “Now I tell everybody who’s got a first offense, if it’s at all triable, try it,’’ said Quincy defense lawyer and former district court judge Daniel W. O’Malley. What makes a case triable is usually the defendant’s ability or willingness to spend. Hiring a garden variety lawyer to fight a drunken driving charge can easily cost $5,000. Jones charges $10,000 to contest a first offense, $15,000 for a third offense. For defendants with another $1,500 to $5,000 to spare, expert witnesses will attack the breath test or raise novel medical defenses. Even in handcuffs, some suspects are already boasting they can buy their way out of trouble. When a 43-year-old driver was arrested she “informed me that she has money and this will all go away and when it does she will have my job,’’ a Lakeville police officer wrote in a 2008 report. The woman admitted drinking eight beers. She blew .24 on the breath test. But Judge Rosemary B. Minehan acquitted her after her lawyer argued the network of roads in the large housing development where she was arrested was not a public way and therefore not subject to the drunken driving laws. While police and prosecutors blame judges like Minehan, defense lawyers have a more benign explanation for the overwhelming tendency of some judges to acquit. They argue that the not-guilty verdicts in Massachusetts bench trials — for four of five defendants statewide — reflect good judgment. They say most defendants who confront damning evidence plead out. The lawyers reserve dubious cases for the jury, they say, where only one of six people needs to find reasonable doubt, and send cases to a judge to rule when a simple matter of law is at issue. “I put slam dunks before a judge,’’ O’Malley said. District attorneys, lawyers say, refuse to dismiss or negotiate cases even when the police lack credible evidence. Drunken driving is more politically radioactive than drug dealing and many other crimes thanks to decades of vigilance by Mothers Against Drunk Driving and others, the defense lawyers say. “There is no mothers against petty larceny or mothers against assault third,’’ said Peter Gerstenzang, a nationally prominent OUI lawyer who practices in New York. Indeed, only 5 percent of OUI charges are dismissed on the day of the scheduled trial, compared with half of assaults. (Assault victims often fail to appear in court.) Several Massachusetts district attorneys insist they drop bad cases, but one generally agreed with the defense lawyers’ view. Moments later he softened that assertion. His office dismisses cases it can’t support, he said. They are hardly the dandies of white-shoe law firms. Jones quit optometry school and bought a sub shop before bartending his way through law school, then working as a prosecutor. In the early 1990s, Jack Diamond, a prominent OUI lawyer based in Hingham, poured beers at Copperfield’s in Boston to supplement his meager wages as a prosecutor. Each took up defense work and found an affinity for OUI law. Today the three lawyers, who once shared office space, are among the busiest and most handsomely paid in their specialty. The three, who each handle on the order of 100 cases a year, are loath to claim a specific success rate, but Jones and O’Malley both say they rarely lose a case with a breath-test reading below .10. 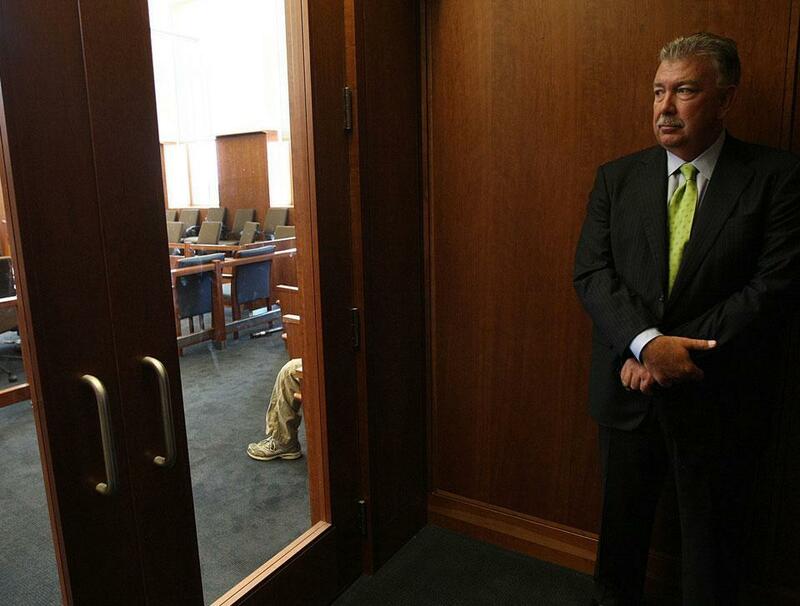 When they walk into a courtroom, court officers smile and clerks nod. The lawyers gossip with police about the latest dim-witted robbery, tease prosecutors over battles past, lean in as court officers whisper their personal verdict on the friendliness of a new judge. It’s a cozy familiarity whose value is not lost on OUI defendants. One judge’s “demeanor clearly changed for the positive when Jack’s name was announced,’’ according to a typical testimonial on Diamond’s website. O’Malley’s website lists 18 courts where they still remember him as Judge O’Malley. When first contacted by the Globe, Waldbaum said he was willing to be interviewed, but only if the newspaper published his website address. The next time the Globe called him, he said, “I don’t give lessons,’’ and hung up. To those who are active in the fight against drunken driving, these OUI specialists contribute to a legal system that too often exonerates drivers who go on to endangers lives. But the lawyers see it as their job to bring every possible weapon to the fight. Jones wrote an 800-page handbook on drunken driving defense in Massachusetts. Earlier this year at the John Adams Courthouse in Boston, he was eagerly detailing the centerpiece of his playbook: how to cross-examine a police officer. Police officers tend to write reports full of gaps, he said. At the end of a long night, they may record the 10 worst things the driver did but leave out many other details over an hour or two of observation. Defendants usually get their day in court months after their arrest, so officers can forget precise details. If any single action is not in that report, the officer will often concede on the stand that the suspect performed it correctly. “The gold . . . is what they haven’t written,’’ Jones said. Jones practices what he preaches. He deployed the strategy in May in the Plymouth trial of the financial worker whose .25 breath test had been suppressed. Jones peppered Officer James Vachon with questions about his client’s behavior that night a year before. “He’s not slumped over . . . or trying to hide anything?’’ Jones asked. “Walking to the rear of the vehicle, he’s walking normally? Time after time, Vachon agreed with Jones. And on a video taken at the police station, the suspect’s speech sounded slow but not slurred, and he was able to recite his Social Security number. Judge Kathryn E. Hand told the young man that she found the officer believable, and that he had certainly driven dangerously. But “I cannot say beyond a reasonable doubt that the cause of your operation in that way was your use of alcohol,’’ she said. The police station or cruiser videos that some departments record sometimes make defendants look less intoxicated than arrest reports indicate. Diamond says the state should mandate the recording of every arrest. Police say that video is expensive and does not capture the subtle behaviors that officers are trained to recognize, and that you do not have to be throwing up or falling down to be impaired. An unpracticed drinker might be unconscious at .25, but an alcoholic with a high tolerance could look almost sober, they say. As for why Judge Hand threw out the breathalyzer result for Jones’s client, the video showed a genuine police mistake. The device’s operator did not observe the young man for 15 uninterrupted minutes, as state rules require. They are supposed to watch to see if the suspect burps, which can bring alcohol from the stomach into the mouth and distort a reading. That odd-sounding requirement of the law is clear but, state officials say, redundant. Today’s machines are able to detect mouth alcohol, voiding tests when it is found. Much of the time, Jones and his counterparts are going up against a prosecutor of limited experience who has had little time to prepare. “District courts have some of the newest prosecutors and some of the most experienced trial attorneys,’’ said Sullivan, the Western Massachusetts district attorney. Rookie assistant district attorneys statewide earn $37,500. “It’s obvious that [defense lawyers] have more resources. You always feel if there were a couple more hours in the day you could do more.” - KIMBERLY GILLESPIE, assistant district attorney, Essex County. Assistant District Attorney Kimberly Gillespie, 28, juggles up to 10 cases a day in Essex County — more OUIs than anything else — and scours law books during her lunch breaks. Busy with other cases that morning, Gillespie interviewed the defendant’s father, a witness, in the hallway just minutes before trial. And then she guided the police officer through damning testimony: The defendant was found, apparently passed out, in a McDonald’s drive-through and held up his cellphone when asked to show his driver’s license. The driver, a crane operator, admitted drinking three beers, the officer said. He first said he had not taken his Percocet that night but later said he did, the officer said. After a 48-minute trial, Judge Michael A. Uhlarik said he did not hear any evidence about the effects of combining alcohol and pain medication. Not guilty, he said. Gillespie quickly gathered her files and moved on to her next case. Edward L. Fiandach zigzagged around a hotel ballroom in midtown Manhattan, so pumped up about defending drunk drivers he could barely contain himself. His words pushed the speed limit. His audience of lawyers attending a refresher course was rapt. His suspenders were adorned with rabbits pulled from magicians’ hats. His specialty is representing people accused in drunken driving accidents that result in death or serious injury. For these most serious cases, he said, winning often means a shorter sentence, not a walk. The speakers at the New York State Bar Association continuing education course were some of the most successful drunken driving defense lawyers in the country, men — and one woman — paid handsomely to pull rabbits out of hats. Over muffins and bagels — no cocktail hour — they told war stories that involved clients who were “smashed,’’ or “toasted.’’ They confided that teachers and heavy drinkers are bad jurors. They argued that field sobriety tests are more difficult than driving. Texas lawyer Doug Murphy gave a primer on undermining evidence from breath-test devices. Crying and stress, he said, can raise a person’s temperature and thus the alcohol reading. A Washington State lawyer attacked the science behind field sobriety tests. They have been studied by researchers during real roadway stops, and most of those impromptu research subjects have been quite intoxicated. So how do we know they really distinguish between sober people and drunks? Why not test 500 senior citizens? Or 500 drywallers who have had back surgery? Even some of these courtroom magicians were astonished by the rules of the game as their Massachusetts brethren get to play it. The fact that Bay State prosecutors cannot tell the judge or jury that a suspect refused the breath test? Only Rhode Island has a similar prohibition. In sharp contrast, states such as California, Nevada, and North Carolina allow police to forcibly draw blood samples from motorists who refuse the breath test. Melanie’s Law was supposed to make refusing the test unpalatable by inflicting severe driver’s license penalties on those who refuse. It didn’t quite work out that way. Former House speaker Salvatore F. DiMasi and House Judiciary Chairman Eugene L. O’Flaherty — both, at the time, among the state’s most powerful defense attorneys — strongly opposed several provisions of the bill that Governor Mitt Romney and Senate leaders sought, arguing they threatened the constitutional rights of defendants. For months, Bersani, the grieving grandfather, haunted the State House, as he later wrote, sharing the story of his 13-year-old granddaughter, Melanie Powell, who was on her way to a birthday party when she was killed by a drunk driver. Bersani left several legislators in tears, but O’Flaherty “just looked at him with the dead fish eyes,’’ recalled Daniel P. Haley, then Romney’s deputy legal counsel, who accompanied Bersani. O’Flaherty remembers the encounter differently. “My heart broke for the gentleman,’’ he said. Under Melanie’s Law, first-time offenders who refuse to take a breath test lose their licenses for six months, two-time offenders for three years, four-time offenders for the rest of their lives. In many states, similar penalties stand even for drivers acquitted of drunken driving, because refusing a breath test is a separate offense: violating the terms of a driver’s license. So the bitterly fought final compromise opened a loophole: A driver who refuses the test gets his license back if he is acquitted. Unless prosecutors can make a special case he is a danger. In a way, it was a double win for defense lawyers. Stiffer punishment means more people hire a lawyer to fight the charge. And taking the sting out of refusing the breath test makes it that much easier to win in court. Melanie’s Law also created new business opportunities. Just weeks before the law began requiring repeat offenders to install ignition interlock devices on their cars in 2006, Jones helped his then-wife start a business that supplies the devices. The business, a franchise of the Texas-based Smart Start Inc., today has the largest share — about 40 percent — of a market split among seven state-approved vendors. Jones said he has never been involved in running the franchise or profited from the endeavor. For those who do take the breath test, the basic science behind the machines is not in doubt. In 2008 the New Jersey Supreme Court upheld the reliability of the Alcotest 7110, the same device used in Massachusetts, after a special master spent four months hearing evidence about its accuracy. This year, a Massachusetts district court judge reached the same conclusion, ruling against more than 60 defendants who argued that the test is scientifically unreliable. But those rulings have not dampened the enthusiasm of defense attorneys for far-fetched breath-test defenses. Listerine, acid reflux, diabetic attacks, and even a high-protein diet can inflate the reading, they have argued. Then there are the experts called on to convince a judge that the driver who was drunk when he blew into the machine was sober when the police officer’s blue lights went on. The theory behind this popular argument is that while he was behind the wheel, the driver was still absorbing alcohol, and the full effect didn’t hit him until he got to the station. That can happen, but only under rare circumstances. In Northampton District Court in March, a welding student, who at 18 was too young to drink legally, acknowledged drinking a 40-ounce beer, swigging vodka, and lying when he told the officer he hadn’t been drinking. He blew .09 on the breath test. But his lawyer called to the stand a doctor who offered his own calculation for what the reading would have been at the time of the stop. His conclusion? He would have been “around .077’’ when he was pulled over. Judge W. Michael Goggins found the young man not guilty, suggesting that he did not look impaired on the police video. In a statement to the Globe, Goggins noted that the prosecutor called the case a “close call’’ and did not bring in an expert witness to counter the doctor. Common challenges to a high breath-test reading don’t hold up to scrutiny, said Guy M. Vallaro, chief science officer at the State Police crime lab, who described several ways the machine tends to underestimate a person’s blood alcohol level. What if the defendant was running a fever? To raise a breath-test result by .01 percent, a driver would have to have a temperature of at least 103, he said. “If somebody calls you up on the phone, and they tell you, ‘My client blew a .25,’ I tell them they need Merlin, not David Benjamin.” - DAVID M. BENJAMIN, toxicologist who frequently testifies for the defense in drunken driving cases. 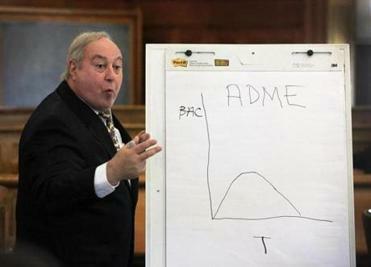 David M. Benjamin is a Chestnut Hill toxicologist who teaches college classes and frequently testifies for the defense. By and large, he agrees with Vallaro. “If somebody calls you up on the phone, and they tell you, ‘My client blew a .25,’ I tell them they need Merlin, not David Benjamin,’’ said Benjamin. Expert witnesses offer defendants another advantage, because assistant district attorneys rarely have the time or the budget to arrange for their own expert. Nor do they often make much effort to challenge a witness’s bona fides, even when they believe the expert has less than credible credentials. But in August 2008, Essex Assistant District Attorney Maura Carlin Officer launched an assault on the qualifications of a familiar face in Massachusetts OUI trials: New Hampshire toxicologist JoAnn Samson, who has testified scores of times in the state. She is Jones’s go-to breath-test expert, partly because she charges only $1,500. Under Officer’s questioning, Samson acknowledged that her physiology master’s thesis was on termites, and that her doctoral work was on a drug used to treat hookworm in dogs. Samson acknowledged that she did not belong to any professional toxicology organization, and that until a few years earlier she spent most of her time working as a lawyer. The three publications on a recent copy of her resume include a letter to the editor. Uhlarik refused to let Sampson testify. But other Massachusetts judges continue to accept her testimony. In an interview, Samson said that she is too busy testifying to publish or to maintain a laboratory that would help her gain admission to professional toxicology groups. Samson, who is active in the Anglican Church, sees her work as a ministry and said she tells defense lawyers when she thinks their clients are guilty and should plead out. For drivers who refuse the breath test — more than a third of suspects — creative lawyers have no trouble cobbling together a narrative to explain the erratic driving or failed roadside tests that led to an arrest. Often, the driver’s attack of nerves when confronted by police, or his fatigue, is enough. The 18-year-old swigging vodka could not count backward because he has dyslexia, his lawyer said. And perhaps smoke from the bonfire where he had been hanging out reddened his eyes. Jones often argues that a long day at the computer can leave anyone with bloodshot eyes. Being older, heavier, or not dressed for the cold will put a driver at a disadvantage, lawyers say. Hip replacements or knee surgery are often blamed for failed sobriety tests. One officer testified that the defendant leaning on a cane in Dorchester District Court last fall not only did not have the cane the day of his arrest, but he also sauntered into the courthouse bathroom the day of trial without leaning on it. The lawyer representing Ron Bell, an aide to Governor Deval Patrick arrested for drunken driving last month, said gout may have affected his performance on the sobriety tests. When a 26-year-old woman tapped another car with her Mercedes in Hingham last year, she told the officer she had been “out with the ladies doing what ladies do.’’ She had no physical problems that would interfere with field sobriety tests, she said. Four days later her lawyer, Jack Diamond, sent her to a podiatrist, who diagnosed lateral ankle pain from her marathon training. He introduced the medical records at trial. Judge Beverly Cannone found her not guilty. O’Malley, the former judge, is also something of an artist at putting his client’s actions in the best possible light. Michael J. Cedrone, who had a previous OUI conviction, got pulled over in Stoughton in February after running a red light in his Ford pickup truck right in front of a police officer. He said he had “had a few,’’ and later refused to take a breath test. Yes, except for that, the officer agreed. Touching heel-to-toe only half the time was “batting .500,’’ and “an extraordinary performance,’’ O’Malley argued. Holding his leg up for 3 seconds was a great effort, even though the test calls for 30 seconds. O’Malley was incredulous when the sergeant insisted that he remembered Cedrone’s smelling of alcohol, because it was not in his report from six months earlier. Bonney, whose sister Lisa was killed by a drunk driver 21 years ago, was emphatic. “I am under oath, and I stand by my testimony,’’ he said. 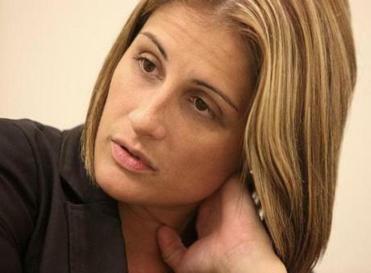 Kelly-Brown said that while the evidence was relatively thin, it was enough to convince her beyond a reasonable doubt. She surprised the courtroom with that rarest of bench trial verdicts: guilty. It was a verdict that wouldn’t stand for long. Two weeks later, O’Malley was back in court with a motion for a new trial. He argued that Bonney’s testimony that Cedrone smelled of alcohol should have been disclosed before trial. It undermined one of his key defenses. O’Malley asked Kelly-Brown to order a new trial “out of an abundance of caution.’’ The judge agreed. O’Malley and his client are due back in court in January.